Here’s what’s up in the world of TV for Tuesday, April 23. All times are Eastern. Teen Titans Go! (Cartoon Network, 7:30 p.m.): After its DC Nation predecessors were cruelly cut down before their time, a new show has risen to avenge its animated brethren: Teen Titans Go! 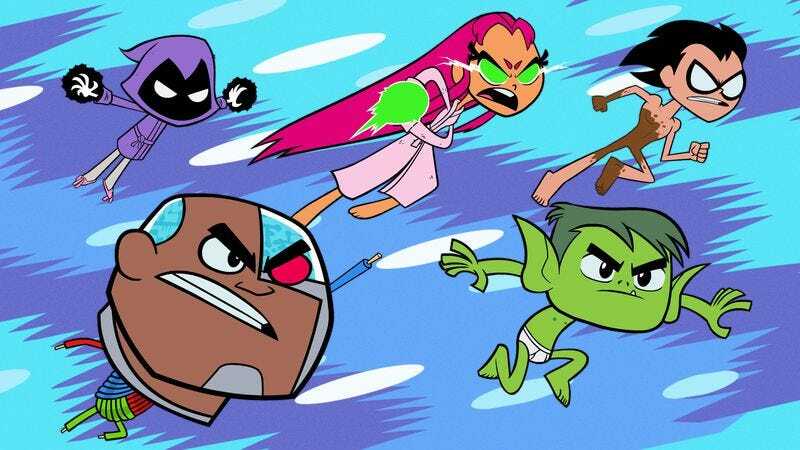 And though it’s been years since their last donned their crime-fighting guises, the cast of Cartoon Network’s original Teen Titans series is back in action—more stylized and exaggerated action, that is. Oliver Sava monitors the team from the shadows, determining whether its members are friends or foes. 30 For 30 (ESPN, 9 p.m.): The 1983 NFL Draft—in which six quarterbacks were taken in the first round—was one of the most consequential in the league’s history. This collaboration between NFL Films and Ken Rodgers brings the event down to size, through the perspective of the man who represented the draft’s two biggest picks. In the first round, The A.V. Club picks Alasdair Wilkins. Awkward. (MTV, 10 p.m.): “Matty becomes distant from Jenna,” says TV Guide—but the question is how distant? Like emotionally distant, or physically? If physically, will the distance be converted to metric units for the benefit of Canadian national Myles McNutt? Citizen Hearst (Biography, 8 p.m.): A documentary disinterested in gold mines, oil wells, shipping, and real estate (and the William Randolph Hearst-inspired Citizen Kane, probably), preferring instead to examine the Hearst family’s ability to be one of the last survivors in the media game. Backyard Oil (Discovery, 10 p.m.): Discovery proves that our own Scott Von Doviak was spot on with this For Our Consideration essay by retrofitting the central premise of The Beverly Hillbillies—mountaineer strikes it rich thanks to some bubblin’ crude (oil, that is)—into a Duck Dynasty-style docuseries. Girl Code (MTV, 10:30 p.m.): We can’t wait until MTV follows Guy Code and the new Girl Code with a series called Konami Code, in which celebrities are granted power ups and 99 lives so long as every viewer punches up, up, down, down, left, right, left, right, B, A at the start of the program. Ke$ha: My Crazy Beautiful Life (MTV, 11 p.m.): When you wake up tomorrow morning and it looks like your television spent all night puking glitter onto the living room carpet, you know which reality series about a cheekily smutty pop star to blame. Kill Bill: Vol. 2 (Starz, 6:40 p.m.): If Quentin Tarntino originally intended Kill Bill to be a single film, he did a really good job of making sure that the more contemplative, dialogue-driven concluding chapter functions as its own standalone movie. NHL Hockey: Bruins at Flyers (NBC Sports, 7:30 p.m.): Look, we know the city of Philadelphia isn’t known for producing graceful losers, but maybe after the week Boston just had, the Flyers should just let the Bruins have this one. It’s not like a win is really going to help last-place Philly’s playoff chances, anyway. Adventure Time: Gunter infiltrates a princesses-only potluck, which sounds downright adorable. Frankly, between that and these new Teen Titan character designs, we’re not sure how all of this cute-and-cuddliness hasn’t melted Oliver Sava into a sentient puddle.